We have seen haunted houses born out of a huge variety of situations. From dilapidated mental hospitals to outbreaks of crazed zombies, haunts burrow into our souls and drag out the most tormenting of fears. In the back of our minds, however, there is the somewhat comforting knowledge that most of these haunts are merely brilliantly-decorated buildings. The sounds were hear, the sights we see, no matter how horrifying, have been constructed for our shockingly pleasure. No such comfort exists at Eastern State Penitentiary. Terror Behind the Walls brings you deep into the intimidating fortress of a once fearsome prison where what you experience may be the performance of the talented actors, but they may also be the lingering echoes of the tortured men who lived and died behind the crumbling walls and rusting bars. Your first stop is the yard outside infamous Cell 7 where you await your sentence. Watch scenes from paranormal explorations of the prison and mingle with your fellow inmates. Don’t get too comfortable, however. Your cellmates have escaped and are coming to find you. Next you are herded into The Gauntlet, a dizzying maze crawling with creatures that make it even more difficult to find your way out. In Lock Down visit a crumbling 102-year-old cell block that was abandoned more than 40 years ago. Tread lightly. The inmates there are just electrified to meet you. Step even further back in time to a cellblock built in the 1800s for Detritus, a pitch black walk through a tangled, overgrown labyrinth of corridors and yard. A prison hospital is a terrifying place. The Infirmary brings you into the eerie chambers were the sick, injured, and dying were kept. In the psychiatric ward you will come up close and personal with what happens to the human spirit when kept in a cage for decades. Try to imagine what it was like to be a guard at a 1800s prison. Night Watch gives you no more than a flashlight to guide your way through the absolute darkness of the prison. There is nothing more terrifying than reality. Eastern State Penitentiary forces you to come face to face with the very stark reality of prisons. This prison is long-since abandoned by living residents, but many believe those who made the history of this prison as twisted and bloody as it is still call it home. It earned its place on our list with its expansive attractions, dedicated actors, and the truly tormenting realness of the entire experience. The number 13 appears again. This time, however, the haunted house promises an exploration of the mythical 13th floor. Most buildings, as the creators of the haunt will tell you, do not have a 13th floor. Rather, there is a 12th and then immediately a 14th. Is this merely superstition or is there really something to fear on a floor named for the number of misfortune? Visit Denver’s 13th Floor Haunted House to find out for yourself. Begin your quest for torment in the waiting area where you may feel secure, but don’t let the calm environment fool you. The monsters have escaped and are stalking in every corner. Search for escape by stepping inside a devastated farm house to find the remnants of a zombie invasion. Explore what has been left, but be careful not to expose the battered survivors still hiding in the abandoned home. Stay quiet and walk quickly—the horde is still coming. Once through the house there are three out buildings to survive. The chicken coop, shed, and barn await, filled with the undead and the brave survivors fighting to assert the dominance of the living and reclaim their land. If you emerge from the battle with your brain still inside your skull, head to the queue area for your ascent to the 13th floor. Don’t take your trip lightly. Find a strong grip and hold on…your trip to the 13th floor and back won’t be a smooth one. 13th Floor takes an innovative approach to haunts with an immersive haunted house and a thrilling sensory experience that reminds you exactly why there is no 13th floor in most buildings. 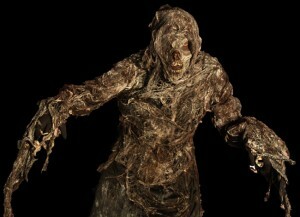 For added fun, the haunt gives every 113th victim that survives both experiences his money back. When most people think of Texas it is thoughts of dry, arid expanses that dominate their opinions. What we discovered, however, was that there is much more to this enormous state than just the dry heat. Visit the deep parts of the state and you will come upon the bayou, the creepy, Spanish-moss draped swamp that has been known to swallow people within moments of them venturing inside. We imagine many nightmares have begun in the bayou, and we were delighted to discover a haunt that truly lives up to its name. The bayou is a dark place. The monsters here come in many forms, from the lurking alligators to the cryptic monsters to the twisted humans who prowl the marshlands in search of the unfortunate souls who have wandered in. Nightmare on the Bayou hunkers in the mysterious, seemingly forgotten regions of the Texas bayou within mere feet of one of the oldest cemeteries in the area. These real graves have offered more than just creepy ambiance to the haunt. Step carefully through the 15,000 square feet of tormenting terror because you may just come in contact with one of the several actual ghosts that have claimed the haunted house as their own. These spirits appear at will and dare you to head further into the realm of the monsters manufactured for your macabre enjoyment. Nightmare on the Bayou touts itself as the only haunted house in the area with real ghosts. This incredibly detailed haunt draws from the purely terrifying surroundings of the bayou and an infestation of actual restless souls to create an experience more than worthy of a spot on our countdown. We love when a haunt gets right to the point. “House of Torment” is a haunted house that lets you know exactly what you are in for…torment. This is not the largest or most complex of the haunts that have earned their place on our countdown, but it packs an incredible amount of blood-chilling, maddening horror into its three attractions. Texas is known for its powerhouse haunts and House of Torment has proven to be one of its best. Blackthorne Asylum should have been a beacon of hope for the physically and mentally ill. Instead it was shrouded in mystery and the dark rumors of horrific experiments that occurred within its stone walls. The evil Dr. Ectobius performed cruel and twisted experiments on his patients, indulging his obsession with nightmares and their control over humankind. It was when he was dabbling in the occult, preparing to open the portal into the Realm of Torment that the doctor reached his collapse. Join other brave explorers as you sneak in to Blackthorne by a secret entrance to discover the horrors that lurk within. If you get out of the Asylum alive, delve deeper into the mystery by venturing into the crypts of the Ancients in Cursed. Here you will find the most horrifying monsters that have ever crept into your nightmares. Make your way past the Hellion and you may have a chance. All that is left is the Slaughterhouse. Here you are hunted, searched by warped creatures set on turning you into one of the murderous scarecrows that dot the expansive cornfields. House of Torment fills 20,000 square feet with Hollywood-quality sets and talented, dedicated actors committed to terrorizing you to the brink of your sanity. Keep your wits about you or you may just end up lost to the experiments of the crumbling Asylum or claimed by the monsters that lurk the expansive haunted house. Nightmare on 13th Street is 36,000 square feet of sheer terror! 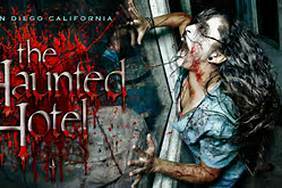 It’s also one of the largest and longest running haunted houses in the United States having been in business for over 20 years. Nightmare on 13th Street has also been featured on the Travel Channel. The spooky atmosphere can be felt even before you enter the front doors! There is an 18 foot animatronics monster, The Slayer that stands guard over the entrance and you can see him from the street. New this year, visitors can brave 13 bonus rooms for an additional $3. Xtreme! adds intensity to the Nightmare on 13th experience with darker, narrower passageways full of surprises. Nightmare on 13th opens at 7:30pm daily (except Sundays) and will remain open through Saturday, October 30th. Admission is $13 for adult and $8 for children 10 years old and under. Discounts are available in exchange for donations of non-perishable food for the Utah Food Bank. VIP/Fast Passes give visitors the option to bypass the waiting line and enter the haunted house directly for an additional $3 above the cost of admission. Nightmare on 13th has been an integral part of developing and continuously innovating the local haunted house tradition for the past 15 years. It is located at 300 West 1300 South, one block west of the Trax baseball stadium station. Haunted house lovers who are ready to get spooked can call the info line at (801) 467-8100 or visit www.nightmareon13th.com. Many years ago there was a rumor that circled in Ohio. The stories told of a haunted house so incredibly frightening, so intensely maddening that no one had ever been able to get all the way through it. The legendary haunt was called “7 Floors of Hell” and each year the whispers increased and the mysterious haunted house became more and more horrifying. It seemed the haunt was just too extreme to be real. The truth was, it wasn’t. There was no such house. That is, until the 1990s when a man with a macabre dream made the haunt into reality. 7 Floors of Hell may not be too terrifying to get through, but victims need strong minds to push them through all 7 torment-filled haunts at this twisted theme park. No visitor is truly prepared for the horrors he will encounter when he steps through the gates onto Monster Midway. Creatures lurk in every corner and custom-created animations blur the line between life, death, and technology. Don’t get too close to the monsters or stop for a picture with that incredible set. It may just try to make you a part of the show. There are 7 haunted houses in the park. More than half of the event is changed each year, making it impossible to know what you are walking into even if you have seen it many times before. In 2013 the Blood Barn, Body Snatchers, Clown House, Killer Theater, House of Nightmares, and Mental Ward are joined by two more maddening events. Climb aboard a coffin and get trapped inside for the ride of your life as you feel what it is like to be buried alive. If you are brave enough, take up arms and join the fight against the Zombie Apocalypse. Over the years 7 Floors of Hell has become a legend even beyond the myths of Ohio residents. With over 100 live actors and intricately-designed movie quality sets, this haunted theme park fills the air with screams night after night. The outdoor setting enables the owners to do huge props and sets that are mindblowing. DeFatta and Bruce keep the fear alive in the Scream Zone, located in North County, San Diego. The Scaregrounds are situated along five acres of the Del Mar Fairgrounds and include rolling floors, strobe lights, fog machines and dripping natural elements. “The Scream Zone has three different events all at one location: The House of Horror, The Chamber and The Haunted Hayride. So there is virtually something for everyone. In the quiet New Jersey countryside there is a scenic farm called Creamy Acres. This farm sat on over 100 acres of beautiful, tranquil land until the darkness broke through. Now every inch of the farm crawls with evil. 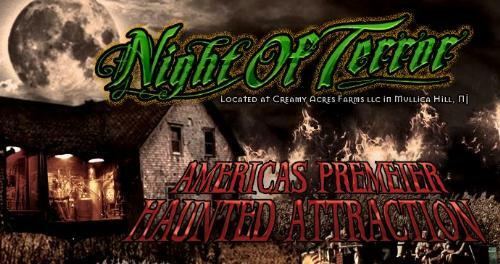 Here to terrorize you at the #15 spot on our list is the Night of Terror, an expansive thrill park featuring 7 haunted houses and attractions, including one of the longest and most elaborate haunted hayrides in the country. It may only be the beginning of fall, but the biting winds of winter swirl across Creamy Acre on Night of Terror. The Frozen Tundra haunted house lures you in with the promise of a refreshing breeze, but soon you find yourself trapped among ferocious beasts looking for a warm body. Escape the wind and snow and you are rewarded with Ride of Terror. Climb aboard the comfortable wagon, but don’t get too settled in. Keep your wits about you as the ride drags you through the longest hayride you have ever experienced. If you want to escape you will need to brave the horrors of the corn field maze. More than scarecrows wait for you there. If the torment brings you to the brink and you want to fight back, try the unique interactive paintball haunt. Here you are armed against the hordes of undead that crawl through the course, hoping to recruit you for their side. With 7 elaborate, extensively detailed haunts, there is plenty here to fill an entire evening of pure terror. The movie quality sets and professional actors of Night of Terror make this one of the most immersive sensory haunts we’ve discovered. No one is safe once they have stepped onto the farm. You cannot even hide in the bathrooms hoping for the night to end. If you are on Creamy Acres, you are the property of the beasts. The Dent Schoolhouse in Cincinnati, Ohio is one of the scariest haunted houses in Ohio. The new attraction for this year is the Queen City Slaughterhouse – just make sure you don’t end up on someone’s dinner plate. The story goes that children began disappearing from the school in the 50s and 60s. First a small group of children disappeared, then another group. Soon after the first group of children disappeared people began to notice a strange smell coming from the basement area of the old schoolhouse. Charlie, the janitor told them that some pipes had backed up and it was nothing to worry about. A few years later another group of children disappeared. This time a mob formed and stormed the school. Imagine their horror when they found the decaying bodies of all the children in the basement. We admit it: the number 13 always calls to us. A haunted house that offers 13 delightfully frightening themed areas is something we simply could not resist. That is what is promised by Louisiana’s 13th Gate. Of course, Louisiana is no stranger to the dark and macabre. 13th Gate does not let this reputation down, ushering in the darkness and luring victims in to a world where their worst nightmares lurk and the only escape is facing them all, one after another. Some haunts offer a creepy haunted house and perhaps a maze. Some may even bring the terror outside and lead you through infested woods and corn fields in search of salvation. 13th Gate, however, amplifies the torment by forcing you through scene after scene that dig deep to those fears everyone has squirming inside. How would you feel creeping your way through a crematory furnace or brave the back of an antique hearse? 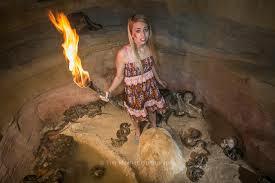 Could you stay calm thrust into a pitch black maze of underground tunnels? Would your heart keep beating if you glanced beneath you to find your feet on a creaking bridge and a writhing swarm of snakes below? When the 13th Gate haunted house is closed for the season, the building is home to a film industry construction crew. The set designers, lighting and sound technicians, and special effect artists have extensive experience with Hollywood films and have won many awards for their efforts. A massive contingency of over 100 actors, 12 makeup artists, and a wide variety of costume specialists combine their twisted talents for a stunningly terrifying experience well worth a spot on our list.